A Middle Eastern food shop without tahina would be a like a pub with no beer. It is one of the requisites for meze cooking, and a great store-cupboard standby for the vegetarian chef. But peops are always asking if we ‘do a smaller jar’ as they only ‘want it for one recipe’. So we thought we’d better write a wee guide on what to do with the rest of it. Of course, it is so thick and more-or-less indestructible, that you could always use it as tile grout if you grow tired of it as a food stuff. The first thing to note is that because tahina is so thick, it is largely inedible in its natural form. It needs watering down, which is best done in a blender as tahina is, after all, oil. The most obvious thing is to make it into a dip or sauce, aka tahini. Blend 2 tablespoons of paste with the juice of 1 small lemon, 2 cloves garlic, a big handful of parsley/coriander, salt and pepper, and enough water to let it down into a dollopable consistency. Make it a bit runnier than you need as it sets in the fridge. 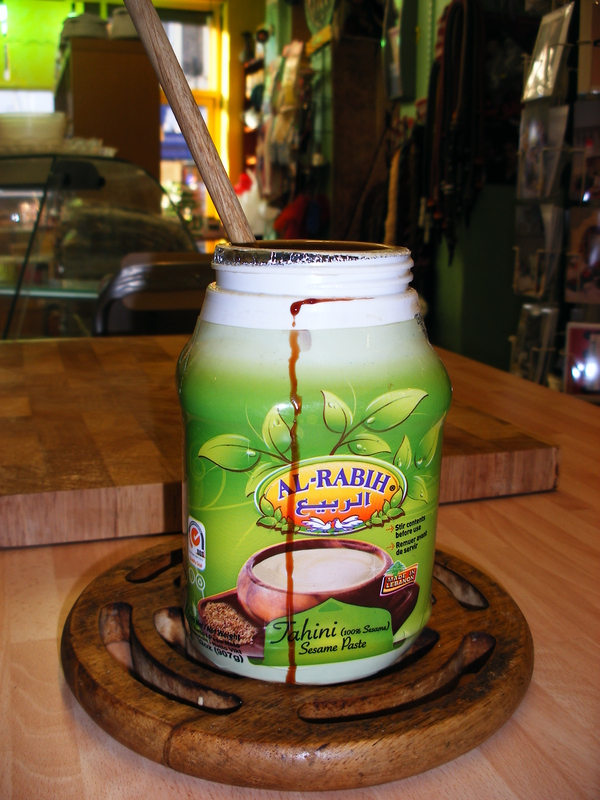 Use the tahini as part of a meze spread, or make it runnier still and drizzle over veg/kebabs. Mix it with date syrup (or pekmez) and then eat with warm bread for a classic Middle Eastern breakfast. Use it to thicken sauces and soups: take a little hot liquid from the pan and mix it with some tahina before tipping the whole lot back into the pan, stirring well to combine. Whisk into lemon based salad dressings; it lends a lovely nutty flavour which will have even the most averred salad-hater reaching for more. Drizzle a little into stir-fries: tahina works really well with green vegetables, and is a natural companion for soy sauce. Make the world’s scrummiest (dairy free) shakes: blend tahina with carob or date syrup, banana, grated nutmeg, ice, and your milk of choice (almond works well here). Share if you must. Mix into a thick paste with ground nuts, vanilla essence, a little brown sugar, a hint of lemon and some ground cardamom, and use as a tart filling. Like Bakewell Tart, only different. Thin and mix with pomegranate molasses to make a cracking ice cream sauce. Sneak it into all manner of purees and dips, from mashed potato to (of course) houmous: there are very few things which tahina does not improve. Make a cocktail. Oh yes. Blend 1 teaspoon tahina with a splodge of kahlua, a smidge of vodka, a dash of Southern Comfort, some cream, a pinch of garam masala, and a little date syrup or honey. Add ice and blend again. Pour into sesame frosted glasses and top up with ginger ale. Uh-huh: good, isn’t it? Let’s call it the Per-Sesame. Right: now we’ve created the need, you can click over here and buy some – there are two sizes from which to choose, but we only do one make as we quite simply believe Al Rabih to be the best.